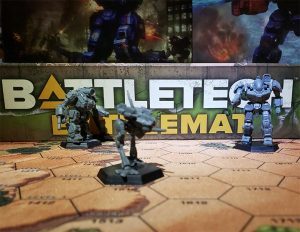 BattleTech is a 2018 computer game by Harebrained Schemes set in the eponymous BattleTech universe. It was announced on 29 July 2015 that a new BattleTech-themed game was going to be made, with additional crowfunding via Kickstarter. The Backer Beta was released via Steam on 01 June 2017; the finished game was first released on 24 April 2018 although development didn't stop there and several updates and expansions were published since. 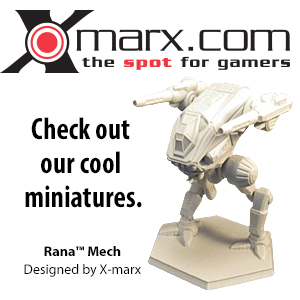 Computer games are excluded from the current definition of Canon for the BattleTech universe. The game thus defaults to apocryphal. Jordan Weisman of FASA fame, often called the "creator of BattleTech", was involved in the making of this game but it was technically produced under the offshoot license for BattleTech computer games that has been a separate intellectual property from the original tabletop BattleTech game, sourcebook and novel line ever since FASA's Virtual World Entertainment Group (and the computer game rights with it) was sold to Microsoft in 1999. However, there was some cooperation between Catalyst Game Labs and HBS regarding this game. CGL Line Developer Randall N. Bills explicitly stated that it was intended for the game's storyline to be fully canonical. While the game as such was not declared canonical, CGL have announced a sourcebook–House Arano (The Aurigan Coalition)–that is expected to largely canonize the worlds, characters and events from the game. The game features turn-based 'Mech combat scenarios at its core, where the player gets to control up to four 'Mechs. Game rules and unit stats were altered significantly compared to standard "classic BattleTech" tabletop play. Mission objectives vary, and while missions are procedurally generated there are also a number of pre-generated missions that serve to narrate the storyline (see Plot Synopsis below). In addition, there is a meta-game with economic and role-playing elements where the player gets to run his or her own mercenary unit (default name "Marauders", though the player is free to give it any other name) and manage their assets including MechWarrior characters between missions. The game is set in the Aurigan Reach region in the rimward periphery, beyond the Free Worlds League, the Capellan Confederation and the Federated Suns and between the Taurian Concordat and the Magistracy of Canopus. The Aurigan Reach was created for this game, including many of its named worlds that had not been mentioned in canon before, by fleshing out what had mostly been a blank slate in previous BattleTech canon. Given that many named worlds will belong to one of the other, larger powers on canonical star maps set later in the timeline, it is understood that the Aurigan Reach and the realms therein are struggling minor periphery powers barely considered noteworthy by the Inner Sphere. In 2910, after the major factions abandoned the area for more than a hundred years, a new state—the Aurigan Coalition—sprang up, centered around the noble families of the trade worlds Coromodir, Guldra and Tyrlon. Coromodir was chosen as the capital and the noble House Arano and House Espinosa became the leaders when the Arano family displaced the figurehead governor the Taurians had left behind in 2820. In 3025 border tensions with the Taurian Concordat rose to a point where war was inevitable, as the Taurians laid claims to border worlds like Qalzi. At the same time, the Capellan Confederation is claiming former Confederate worlds on the other side of the Aurigan Coalition. After High Lord Tamati Arano II died in an space travel accident, the rule of his daughter and heir, Lady Kamea Arano, is ursurped by House Espinosa. With the help of a mercenary unit—the player unit—she sets out to restore her rule over the Aurigan Coalition. The player character's mercenary unit, the "Marauders" (the name may be changed by the player at any time), consists of three non-player characters serving in non-combat roles, plus four initial playable MechWarriors. Over the course of the game there is a wide range of further possible recruits for the unit. Announced 21st August 2018 was the game's first expansion pack dubbed Flashpoint, due to release in November 2018. The expansion includes a new challenging mission type "Target Acquisition" which is focused on territory control best suited to light and medium 'Mechs, new tropical biome and three new 'Mechs including the Crab, Cyclops, and Hatchetman - the first 'Mech not taken from MechWarrior Online. The expansion's key feature is Flashpoints, high-stakes branches short-stories which are comprised of procedural missions, like all non-story missions in the base game, linked together by new crew conversions and special events. To ramp up the intensity, some Flashpoint stories feature "Consecutive Deployments" in which players will not be able to repair their 'Mechs between missions. Announced 18th October 2018 as part of the promotional materials for the season pass for the game, with a release date of Summer 2019. Q: "[D]oes your work on MWO and HBS-BT mean the Hero 'Mech fluff in the former and the campaign storyline in the latter are canonical for the core (CGL) BatteTech lore?" A (by Randall Bills): "For the Hero 'Mechs, absolutely. And that is the intention with the HBS campaign storyline as well." Harebrained Schemes LLC: Kickstarter Update #28: "History of the Aurigan Reach"
Harebrained Schemes LLC: Kickstarter Update #48: "Battle Stations! This is not a drill!" This page was last edited on 23 January 2019, at 00:25.